When you’re starting the Low FODMAP Diet, it can be hard to find sweet treats to keep on hand. Even if your local bakery has a gluten-free section, most cookies and cakes still use high FODMAP flours and sweeteners. That can make it hard to curb your chocolate cravings in a pinch. This is one of the reasons I love these low FODMAP haystack cookies. I can make a big batch and store them in the freezer. That way, when a chocolate craving hits, I don’t have to choose between my tummy and my taste buds. These awesome cookies are packed with chocolate and have a delicious chewy crunch. They’re also freezer friendly which is handy because this recipe yields 40 cookies. If you’re feeling extra fancy, they’re also amazing on lactose-free ice cream… But, you didn’t hear that from me. Think these low FODMAP haystack cookies sound great, but you don’t have time to try them now? You can PIN THIS POST for later. 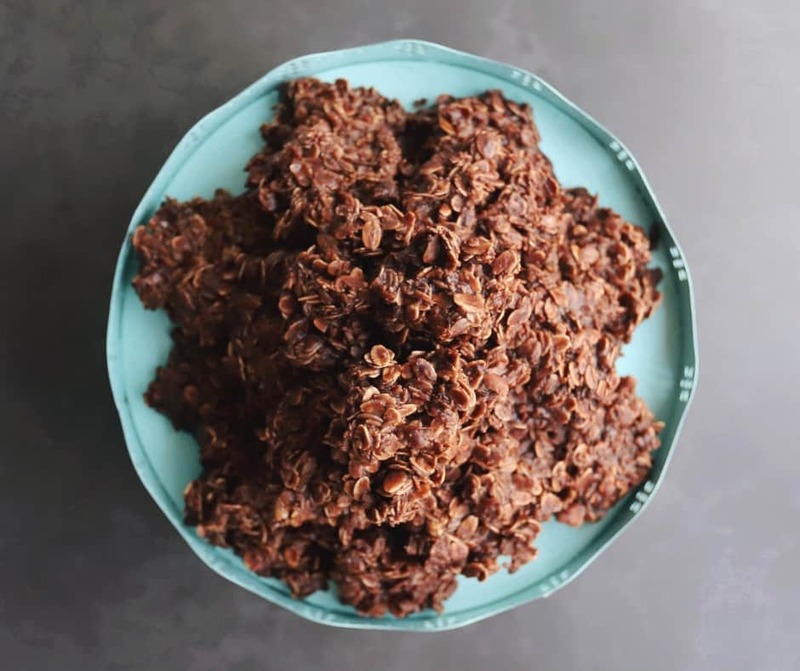 These low FODMAP haystack cookies will curb your chocolate cravings in no time. Check out the notes below for tips on keeping this recipe FODMAP friendly. First, we’ll talk about oats. According to Monash University, oats are safe in servings of 1/2 a cup. However, some people still find them hard to digest. If you know you have issues with oats, start with one or two cookies and see how it goes. Also, remember, unless you have celiac disease, you don’t need gluten-free oats. 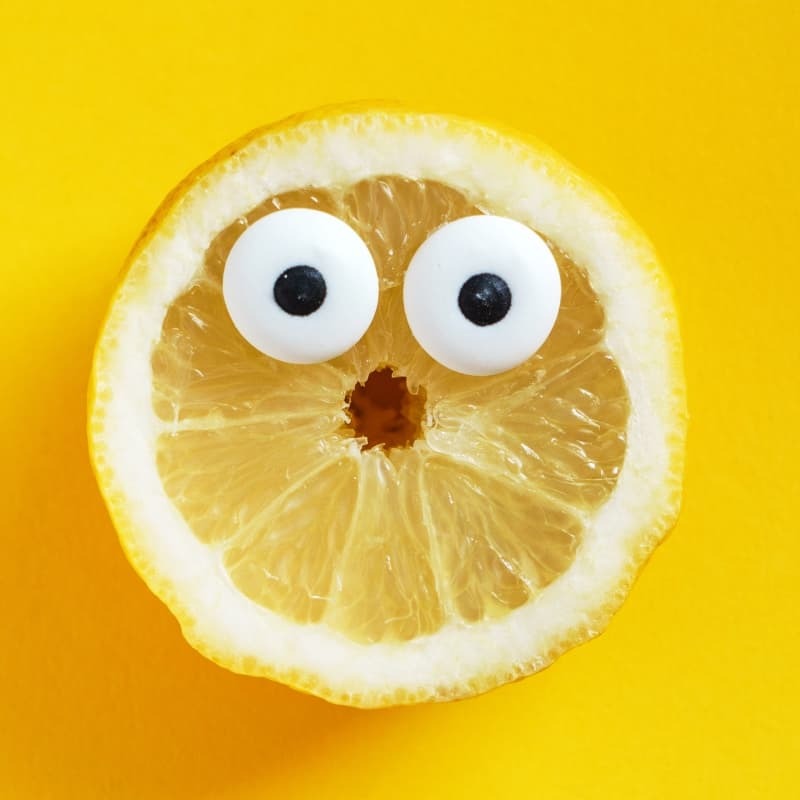 Patients on the Low FODMAP Diet use gluten-free products to avoid the FODMAP fructan. Choosing gluten-free oats won’t change the FODMAP content. Next up, is milk. If you’re in the elimination phase, you’ll need to use lactose-free milk. The fat percentage isn’t important in this recipe, so you can use whatever you have handy. This recipe also uses cocoa powder. According to the Monash app, cocoa is safe in servings of 2 heaping tsp. We use 6 tbsp, which works out to 0.5 tsp per cookie. This is within the recommended range. Our final ingredient is shredded coconut. Monash says shredded coconut is safe in servings of 1/4 cup. This recipe uses 1/2 a cup of coconut for 40 cookies, which works out to 0.2 tbsp per cookie. 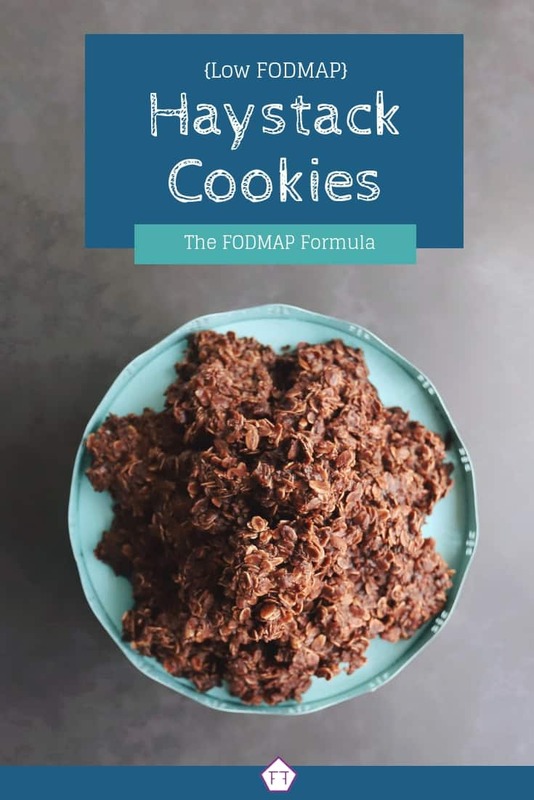 Want to try these low FODMAP haystack cookies? Don’t forget to PIN THIS RECIPE for later. Looking for a quick and easy FODMAP friendly treat this summer? Try these low FODMAP haystack cookies. 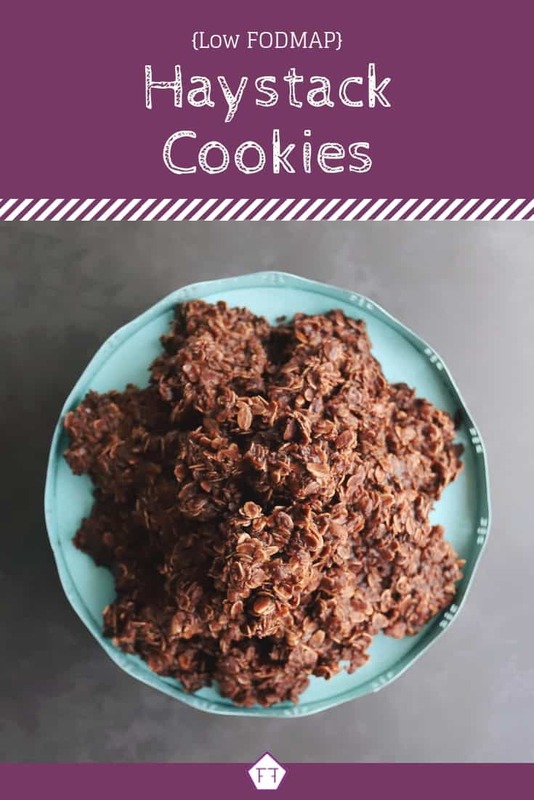 Packed full of chocolate, oats, and coconut, these mouth-watering cookies will make your tummy and your taste buds happy. Heat butter, sugar, and lactose-free milk into a medium-size saucepan. Stir often until the mixture boils. Remove the saucepan from heat. Add cocoa, oats, shredded coconut, salt, and vanilla and stir until all ingredients are evenly coated. Drop rounded spoonfuls of the mixture onto wax paper and allow to cool completely on the counter (about 2 hours). Store in an airtight container at room temperature. While this recipe is technically stored at room temperature, I secretly keep mine in the fridge. Keeping the cookies chilled makes them a little more solid and helps the butter regroup which adds a texture I really enjoy. My husband has repeatedly rescued his portion from the fridge and returned them to our counter, so, to each their own. 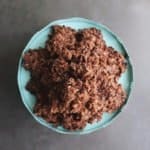 I hope these low FODMAP haystack cookies help you fill your freezer with FODMAP friendly treats. If you like this recipe, subscribe to my mailing list below. 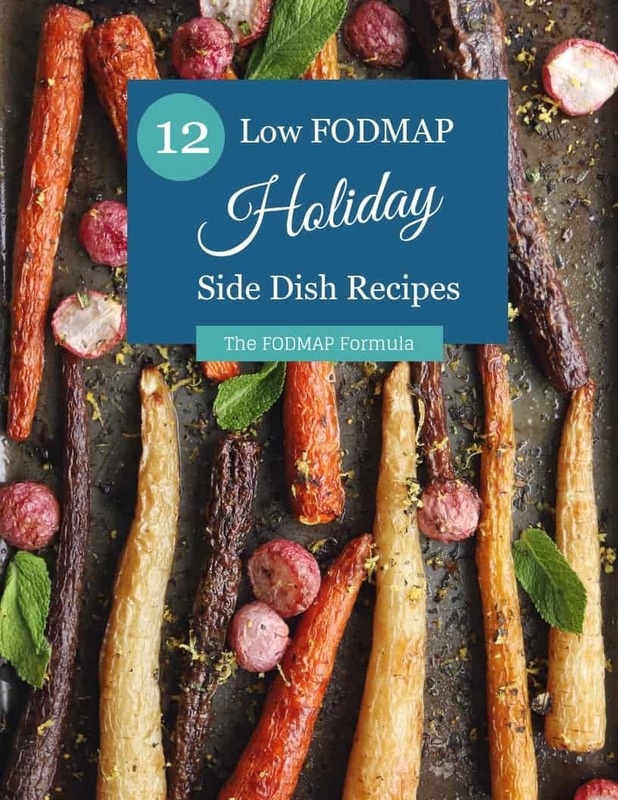 You’ll get new low FODMAP recipes and articles delivered right to your inbox. Curious about what else is happening in The FODMAP Formula kitchen? Follow me on Instagram for bonus recipes and a sneak peek at my latest experiments. Together, we’ll get the Low FODMAP Diet down to a science! Hi, Debbie. I’ve added you to the list! Is any peanut butter or even almond butter allowed on FODMaps? I feel like this just wouldnt be the same without it… Also Hate coconut, is it ok to leave it out? According to the Monash app, 2 tbsp of peanut butter or 1 tbsp of almond butter would be low FODMAP. As for these haystack cookies, you can certainly leave the coconut out if you’d like. If the issue is with the flavour, you can’t actually taste the coconut shavings. They’re mostly for texture. My husband also hates coconut and he LOVES these cookies. If you wanted to give it a try, you could also start with half the recommended amount of coconut and see how you like it before removing it altogether. Previous post: What is Irritable Bowel Syndrome (IBS)?